Booking system for Mantagi Island Resort. Mooball IT developed a fully online booking and resort management system for the Matangi Island Private Resort. Prior to this system all 200 agents and booking were managed via email and spreadsheets. A fully online system providing real time availability information, detailed reports on occupancy and CRM tracking of guests has changed the way MIR works and allowed them to expand their agent base significantly. Climate Friendly™ is an organisation dedicated to positive, meaningful and real action to address the global greenhouse problem. Their goal is to make it quick and easy for businesses and individuals to take immediate and meaningful action on climate change. They do this by investing in renewable energy projects that effectively keep carbon in the ground. Using Drupal CMS Mooball was able to apply the original designs created by Digital Eskimo in Sydney. Mooball was also tasked with developing an API for Drupal and Send Studio to facilitate the sending of regular news bulletins to the subscribers of newmatilda.com. Beautydirectory is the essential and reliable guide to beauty brands, products, PR agencies and companies in Australia and New Zealand. It is a resource that features the latest beauty industry news, interviews and social pictures, in addition to a large database that includes brand and product information with contact details, key experts, PR resources and a media directory. 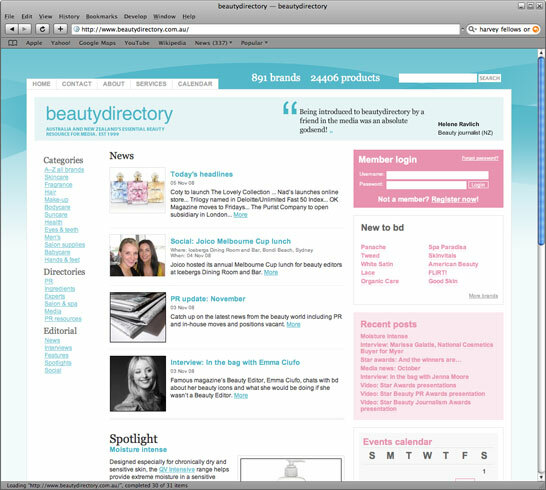 Beautydirectory members-only website for beauty editors, beauty journalists and industry insiders. The system is developed in Plone and integrates a MySQL database for the brand and product directory. Using Plone CMS and PHP/MySQL we were able to set-up multiple sites that were linked by authentication and branding. Plone was used for the intranet sites, while PHP/MySQL was used for CRM and call centre sites.